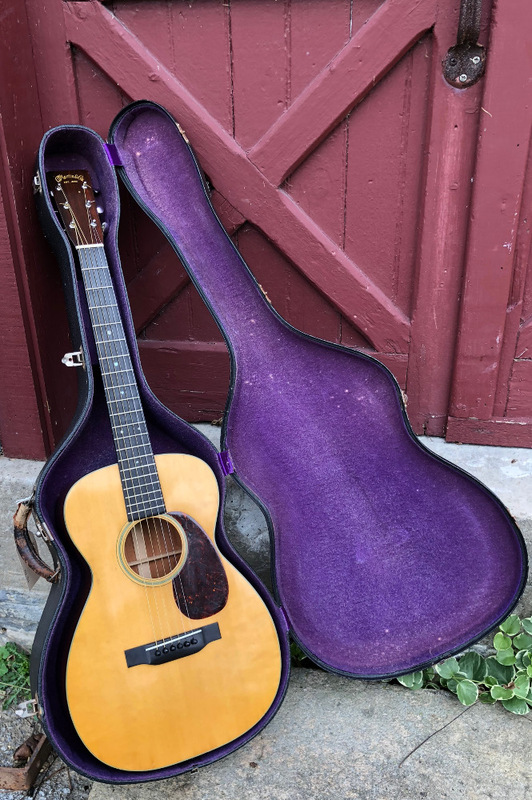 Martin 0-18 1937 | SOLD | Collectors and players of Martin guitars consider the 1930s to be the ‘Golden Age’ of Martin guitars. 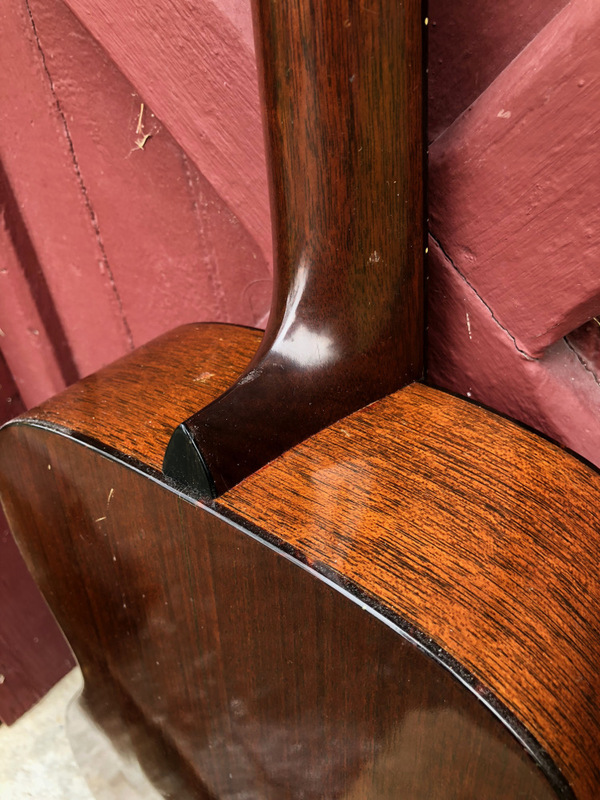 By this time in its venerated history, the Martin flat top had evolved into what was has become the icon of flat top instruments. High-grade materials and skilled craftsmanship combined to produce some of the best flat tops ever made, and are highly esteemed today. This 0-18 dates to 1937, and is in excellent, original condition, a rare find today. 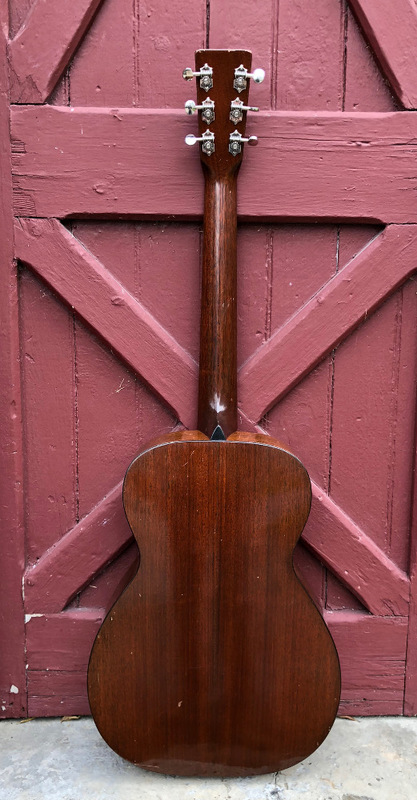 It exhibits all the hallmarks of the 0-18 line, including mahogany back and sides; spruce top bound in black and white celluloid with a faux tortoise pick guard; ebony bridge; ebony fingerboard with pearl position dots; individual Grover tuners; Brazilian rosewood overlay on the head stock; mahogany neck. The guitar retains what is likely its original hard Geib (G&S DuraBilt) case. This guitar was built at a time when Martin was going through some structural change to its instruments, notably, the placement of the X-brace. By 1937, the 0 and 00 line had already transitioned to the so-called ‘rear-shifted’ X-brace, and a change from Brazilian fingerboards and bridges to ebony; both changes are found on this example. At some point in its past, the treble side of the bridge was shaved slightly for lower action. Otherwise, the guitar shows no evidence of prior repairs, or damage. 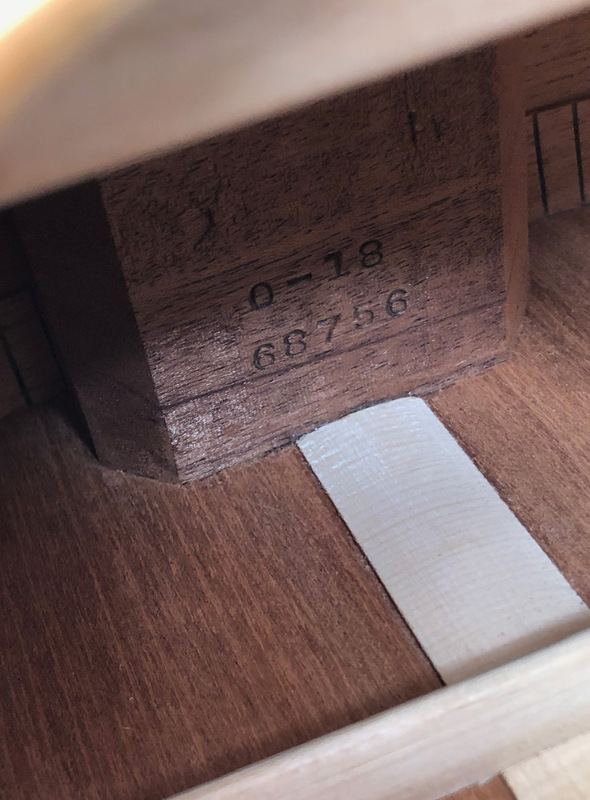 The ivory nut appears original, as does the end pin. The bridge pins might be replacements. The neck was recently reset, and the frets leveled and dressed. The body measures 13 1/2” across at the lower bout, and scale length is 25”. Action is set at 5 & 7/64”, and the guitar plays easily. Superfine tone, superfine condition! The 0-18 is a fantastic fingerpicking guitar, and examples in this condition, from this era, are regarded by many as ‘lifetime’ guitars. Comes with its likely original Geib hard case, although the fit feels better suited to a 00-size.